Everybody knows that the blues comes out of the south, and was played on acoustic instruments. Then the blues migrated to the cities, and the urbanization of the blues brought about a lot of changes with all the influences that were there. 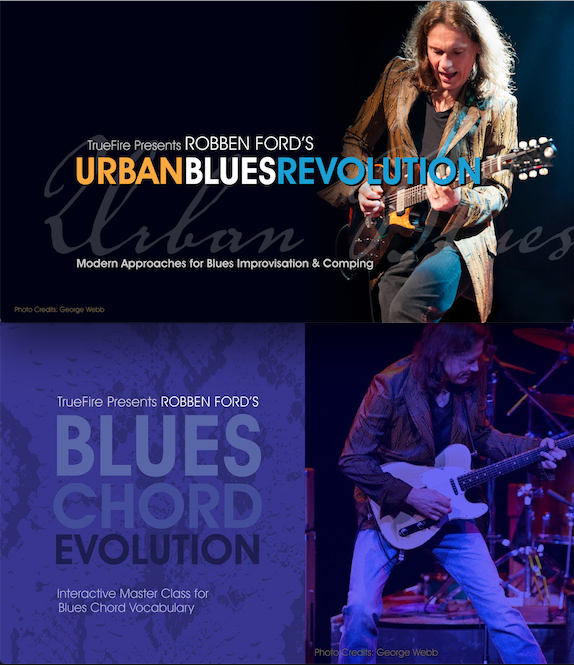 The most radical was the electrification of the blues - the use of amplifiers and electric guitars gave rise to a variety of tones and signature voices.Robben Ford’s Urban Blues Revolution examines this modernization of the blues with rhythm and soloing examples, both of which illustrate traditional approaches followed by a more contemporary approach. For each of the 6 sets of Performance Studies, Robben will first play rhythm guitar over the track, and then solo over the track providing insight for his approaches. ”We're going to work with six tracks that are inspired by the modernization of the blues. For each of these rhythm tracks, I'll show you the way that it was traditionally played, and then show ways that I'd play it today. Also, I'll show you how I'd solo over these tracks. Blues Boogaloo: Rhythm & Blues Boogaloo: Soloing ”’Blues Boogaloo’ is inspired by a song by Slim Harpo. I'm going to play the basic rhythm part for that, and then expand on it. I'll then play over the track so that you can get some ideas for soloing. Dance Hall Slim: Rhythm & Dance Hall Slim: Soloing ”I'll play rhythm over a track we call ‘Dance Hall Slim’, which actually has some Cuban influence in it. And then we’ll look at some of my improvisational and soloing ideas for this track. ”’Back Street Vamp’ is something that the rhythm section and myself came up with when preparing for this course, and gives us an opportunity to play a few more chords than some of the three chord blues tunes. After you've seen some of the chordal ideas for ‘Back Street Vamp’, I'll play some solo ideas for you. King Snake: Rhythm & King Snake: Soloing ”This is 'King Snake’, a four-on-the-floor, straight up 12-bar blues. After I present some rhythmic ideas for ‘King Snake’, I'll take some solos to illustrate how to play over this type of groove. Roll With It: Rhythm & Roll With It: Soloing ”With this study, I'll play rhythm guitar on a track we're calling 'Roll With It’, which is a one chord jam in A. After presenting some rhythmic ideas for ‘Roll With It’, I'll take a solo over this one chord. Robben will explain and demonstrate all of the key concepts and approaches along the way. You’ll get standard notation and tabs for all of the rhythm and soloing Performance Studies. Plus, Robben includes all of the rhythm tracks for you to work with on your own. In addition, you’ll be able to loop or slow down any of the performances so that you can work with the lessons at your own pace. Grab your guitar and let’s get urban with Robben Ford! ﻿If you play the blues, you’re likely playing rhythm guitar 90% of the time, either comping for the vocalist or for another soloist. As most blues are comprised of simple 1-4-5 variations, you need command of a large vocabulary of chords to color up your rhythm parts and keep things interesting for the audience as well as for your band members.Robben Ford’s Blues Chord Evolution is not only a compilation study of Robben’s favorite go-to blues chords, it’s also the quickest way to expand your own blues chord vocabulary.”Over the years, I've developed a strong relationship with chords. It began with a book by a man named Mickey Baker, Jazz Vol. 1. Many of the things I learned in there, I saw that I could immediately apply to 12-bar blues playing, particularly Chicago blues. It was a perfect match! Over time, I learned my own way of applying these chords to the blues, which I'm excited to show you here in Blues Chord Evolution.”Robben organized the course into 14 sections. Each section focuses on a specific chord type. All of the sections feature demonstrations, a performance study, and an analysis and break down. You’ll start the course learning some basic open position chords (with a little embellishment). From there, you’ll learn major triad barre chords with some extensions. Then you’ll dig deep into how Robben uses minor 7th, 6th, 9th, and 11th chords. Dominant chords are next — dominant 7th, 9th, and 13th. Robben winds up the course with some altered chord voicings. Simple Open Chords: Demo & Concept/Performance/Analysis ”We're going to start with a real simple blues in G major. I'll perform a blues using simple open chords in G major. The chords are an open G major, an open C major as the IV chord, and an open D major as the V chord. Take your time with the performance, and when you're ready, move on to the analysis and explanation section where I'll break it down for you." Open Triads Evolved: Demo & Concept/Performance/Analysis ”I could say that Bob Dylan is my favorite "white" bluesman, which might surprise people, but he did do a lot of things in the blues that weren't done before. Here I'll perform a blues progression taking advantage of open chords, all of which are triads. This is similar to something that Bob Dylan might do — not necessarily sophisticated, but something that's all his own. We're using open triad chord voicings here. These have that open, tender, major sound that feels like home. There's nothing aggressive about it at all." Open Extended & Sus Chords: Demo & Concept/Performance/Analysis ”This is in the spirit of using open strings and taking a "strummy" approach to the blues. We're also going to add in the flat 7th (minor 7th), opposed to the major sounds we've been playing so far. Let's take a look at the chords and get ready for the performance. Moving on from the major sound of the last two performance studies, this progression adds in the minor 7th and sus chords to mix things up." Slash Chord Sophistication: Demo & Concept/Performance/Analysis ”I'm going to add a couple more chords to our 12-bar progression now, utilizing some slash chords. This performance adds in slash chords to our blues progression. The slash chords here really flesh out where the progression is going. To me, there's a "softer" quality here— the chord voicings make it so it's not so much right down the middle. Take your time with the performance, and when you're ready, move on to the analysis and explanation section where I'll break it down for you." Simple Barre Chords: Demo & Concept/Performance/Analysis ”I don't use a lot of barre chords in my playing, as it makes me feel "locked in" to a certain position. I like the freedom to move around, but there are times when barre chords are needed, depending on the musical situation. Here we'll be going over some barre chords and using them in our 12-bar blues. We’ll take a look at some situations where barre chords are a great choice. Learn the progression, and work with the performance study at your own pace." Barre Sevenths & Sus: Demo & Concept/Performance/Analysis ”This will be the same feel and harmonically the same as the previous study, however this time we're using barred 7th and sus chord voicings through the progression. You might notice that there's a little bit of Rolling Stones here, and indeed Keith Richards would play something like this, but he'd be using an open tuning. So, unfortunately, we'll have to work a little harder with the barre chords." Common Minor Sevenths: Demo & Concept/Performance/Analysis ”This 12-bar blues is made up of only minor chords — specifically, I'm using three basic minor 7 chord voicings. Listen for some of the things I do to add color to these chords and make them interesting. Keep an eye out for those things that I do to add color to the progression — slaps, pull-offs, etc. that keep things interesting. Take your time with the performance, and when you're ready, move on to the analysis and explanation section where I'll break it down for you." Minor Ninth & Sixth Chords: Demo & Concept/Performance/Analysis ”I'm going to show you a couple of minor 9th chord voicings, as well as some minor 6th chord voicings. We're in the key of D minor here. Since there's no bass underneath me, I instinctively go to playing the bass line so you can hear the chords better. Take your time with the performance, and when you're ready, move on to the analysis and explanation section where I'll break it down for you." More Minor Ninths and Elevenths: Demo & Concept/Performance/Analysis ”Here we've got some more chords to take advantage of with our minor blues progression. You'll hear the minor 9th here again, but I'm utilizing minor 11th chord voicings as well. Take a listen, and then work with the chords at your own pace. Next, check out the analysis and explanation to break the performance down." Chords for Blues Intros: Demo & Concept/Performance/Analysis ”This is what I would consider an "intro" to an A minor blues. I'll first show you how it'd be played in the traditional sense, and then we'll go through a "hipper" way of playing it with some cool chord voicings. The first run through here, I'm sticking to a traditional approach to an "intro" section of a 12-bar blues. Then, we'll stretch out a little bit and make the chords a little more interesting." Dominant 9's & 13's: Demo & Concept/Performance/Analysis ”Here's a series of chords in the key of A over a slow shuffle feel, focusing on using 9th and 13th chord voicings. Here we'll run through the chords, and then move on to the performance. Take your time with the performance, and when you're ready, move on to the analysis and explanation section where I'll break it down for you." Dominant 13 Throw Down: Demo & Concept/Performance/Analysis ”We're looking at 13th chords here, with the progression being made up of them almost entirely. I think that you'll find that it's a versatile chord with lots of applications. It's a great voicing that can twist your ear in a lot of different directions and works in a lot of different playing situations. We're using 13th chord voicings here, but then eventually I'm adding in the flat 9 to the chord structure to mix it up. You can move the 13th chord shape in minor thirds and you'll always be in key!" More Dom 13 Voicings: Demo & Concept/Performance/Analysis ”Now I'm going to show you some more 13th voicings that we haven't looked at yet. There're some cool moves here that you can use to build a melody and get from one chord to another. Take your time with the performance, and when you're ready, move on to the analysis and explanation section where I'll break it down for you." Altered State Chords: Demo & Concept/Performance/Analysis ”For our final performance study, we're taking a look at altered chords over a blues. We’ll wrap up by looking at some options for using jazzy sounding altered chords over a blues progression. Watch me play through the progression, and work with these chord voicings on your own. When you're ready, check out the analysis and explanation video to break it down." Robben will explain and demonstrate all of the key concepts and approaches along the way. You’ll get standard notation and tabs for all of the performance studies. Plus, Robben includes all of the rhythm tracks for you to work with on your own. In addition, you’ll be able to loop or slow down any of the videos so that you can work with the lessons at your own pace. Grab your guitar and let’s expand comp some blues with Robben Ford! If you play the blues, you’re likely playing rhythm guitar 90% of the time, either comping for the vocalist or for another soloist. As most blues are comprised of simple 1-4-5 variations, you need command of a large vocabulary of chords to color up your rhythm parts and keep things interesting for the audience as well as for your band members. Robben Ford’s Blues Chord Evolution is not only a compilation study of Robben’s favorite go-to blues chords, it’s also the quickest way to expand your own blues chord vocabulary. Robben organized the course into 14 sections. Each section focuses on a specific chord type. All of the sections feature demonstrations, a performance study, and an analysis and break down.